Corsair has announced the One Pro i180, the company’s most powerful and compact gaming desktop it has ever created. Fitted with an Intel Core i9-9920X and Nvidia GeForce RTX 2080 Ti, Corsair has gone even so far as to claim its gaming desktop is now as powerful as a workstation. Both the 12-core processor and GPU fitted into this system are liquid-cooled by the brand’s latest platinum-series cooling systems. In order to expel the added level of heat from its latest system, Corsair claims it has reinvented its patented convection-assisted liquid cooling system while also restructuring the internal layout for better airflow. These improvements help the Corsair One Pro i180 run 22-degrees Celsius cooler than even its previous Coffee Lake-powered systems like the Corsair One Elite. This is even more significant when you consider this PC has gone from using a 95W TDP CPU to one rated at a 165W. The Corsair One Pro i180 also comes fitted with 32GB of Corsair DDR4 memory, a 960GB high-speed M.2 SSD drive and 2TB HDD. 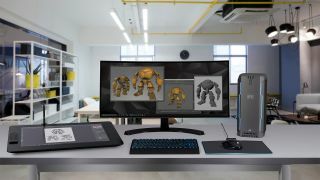 Of course, a PC this powerful demands a high price and it’ll be available for $4,999 (about £3,915, AU$7,000) when it arrives on February 12th with pre-orders beginning today. Alongside its flagship gaming PC, Corsair also introduced two additional versions of the One. The Corsair One i160 is a slight step down from its bigger brother, but still a very powerful system thanks to its Intel Core i9-9900K processor and GeForce RTX 2080 Ti graphics card. One more tier down is the Corsair One i140 that features an Intel Core i7-9700K processor and GeForce RTX 2080 graphics card. Both of these PCs also feature 32GB of Corsair DDR4 memory, a 480GB high-speed M.2 SSD drive and 2TB HDD. The Corsair One i160 will arrive on February 12th for $3,599 (about £2,820, AU$5,040), meanwhile, the Corsair One i140 is available immediately for $2,999 (about £2,350, AU$4,200).